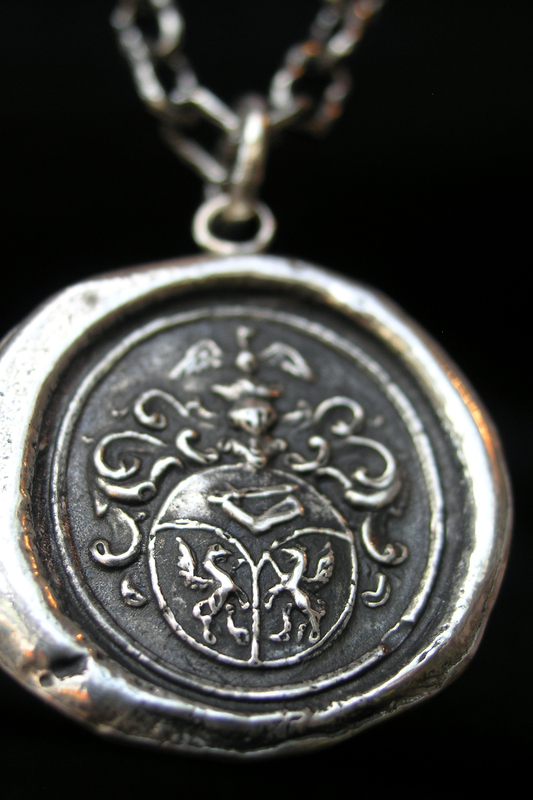 Pyrrha owes its origins to a decrepit box of wax seals dating back to the 1800s. When founders Wade Papin and Danielle Wilmore discovered the seals, they set out to master traditional lost-wax casting and emerged with a line of handcrafted talismans. Pyrrha’s pieces highlight the striking loveliness of classic family heraldry, as well as the work-worn beauty of the vintage stamps. Reflected in their work and even their studio—a 100-year-old Vancouver home—Pyrrha’s designers have a deep respect for history and ritual. With an expanding line of products, Pyrrha has added to their original talismans with pieces as diverse as: cufflinks, tie clips and other men’s accessories; keys and charms; and even a line of official HBO’s Game Of Thrones products in the signature Pyrrha style. All jewelry is eco friendly and is cast in reclaimed and recycled sterling silver and karat gold. Print material is 100% biodegradable and the studio features in-house recycling practices and an organic garden. Sold across the world, worn by celebrities and no stranger to Hollywood costume design, Pyrrha is earning its deserved recognition.